Too Busy To Tweet? Try the Timely App. Want to grow your social media presence but you’re too busy helping clients buy and sell real estate? Add a Timely bookmarklet to your web browser (just drag and drop). You add your Tweets to Timely. 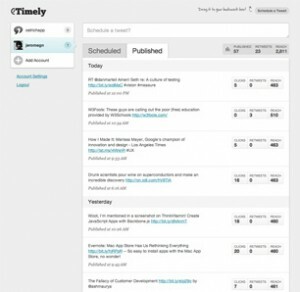 Timely analyzes your previous 199 Tweets and determines the best time to Tweet the links in your cue. I don’t know about you but my morning ritual often involves, editing and reviewing the day’s post, then opening up my Feedreader and looking for content to share. Most of the time, I’ll share content that I think followers might find interesting via Timely. This way I’m not overwhelming the timeline with a bunch of Tweets in a row and I can move on to other things. Then let me know what you think. Do you use anything else to schedule your Tweets? Like Hootsuite?